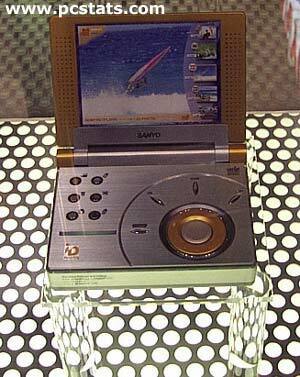 In this Sanyo prototype from the same mobile-phone display, the designer opted for two back-lit colour LCD screens, and an additional LCD display for general phone features (upper left bar). The object coming out of the unit, middle right, is a camera if i remember correctly. 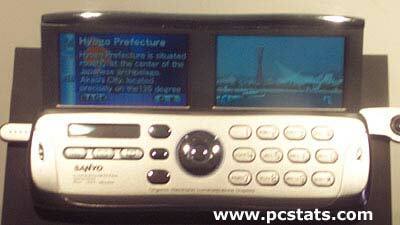 This Sanyo prototype is of a nonfunctioning DVD player. Probably designed with the movie-fanatic traveler in mind, the metal construction gives it a very rugged appearance that would hopefully survive more than one transatlantic flight. 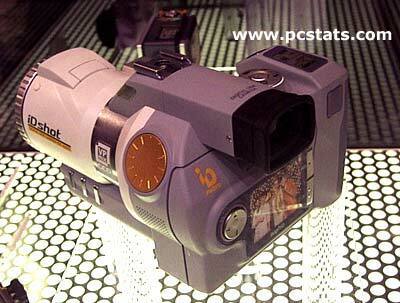 The Sanyo iD-shot is a non-functioning prototype of a digital camera. We're not sure if the unit is meant to store images and digital movies on flash media, micro drive or CD-RW. With a viewfinder and back-lit colour LCD display, along with attachments for traditional flash attachments, the camera would appear to be targeted towards the professional photographer.